Well, it’s officially autumn here in Florida. Which means the humidity drops a little and it’s not 100 degrees every day with the heat index. I do miss the changing of the leaves and the crisp fall air. It is always a reminder that the holidays are coming. But, regardless, it is time for me to paint Christmas ornaments for an upcoming art and craft show here in Mt. Dora, FL on October 27 and 28. They were a big seller last year in the Gallery and fun to make. 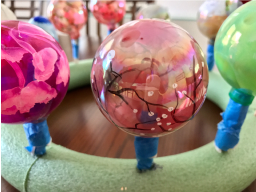 I recently had an artist ask if I would do a local class on hand painting ornaments, but my class topics were prescheduled, and we couldn’t fit it in. So, the next best thing is a video tutorial. I am excited to bring that to you today! window color which dries fairly clear. Some artists use white acrylic paint, which is also an option. I’m just too impatient to wait for the white paint to dry to start painting the outsides. You can see it is translucent. 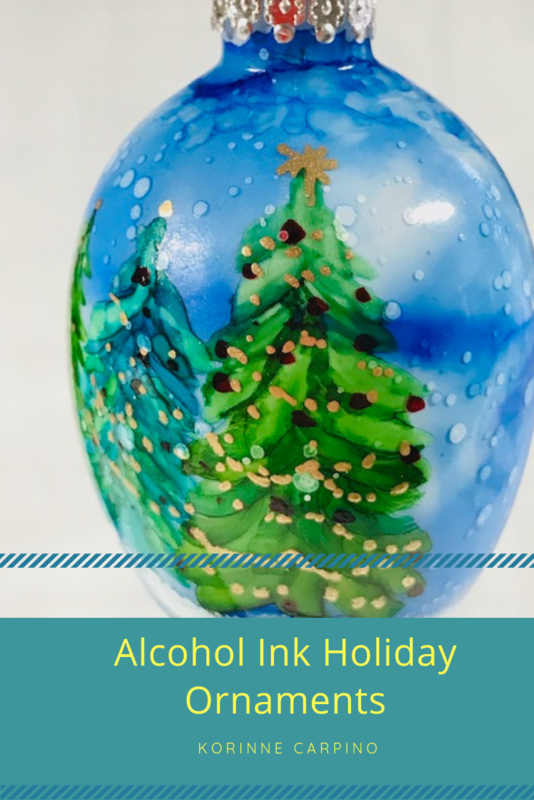 I like to use Jacquard Pinata brand inks to paint the outside of my ornaments. The inks are thicker and have more saturated colors. They seem to adhere to the glass better than other brands in my experience. Once I am done painting the outside of the ornament, I like to let them sit for a day. I then spray them with 2 coats of Krylon Kamar Varnish and after that dries, I paint on one coat of Liquitex glossy varnish. 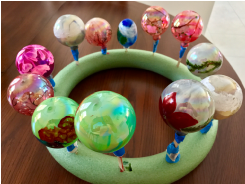 You can see I have wrapped the popsicle sticks with some paper and blue tape to widen the surface so the ornaments don’t fall to the foam area. Have fun making your ornaments, and please share! I would love to see your creations!